Hail, Caesar! won’t be remembered as one of the Coen Brothers’ masterpieces. An homage to Hollywood of the 1950s, this is more of a niche film than a mainstream offering. It’s an opportunity for Joel & Ethan Coen to use the era as a cinematic playground. Hail, Caesar! allows the filmmakers to dabble in ‘50s-style productions and includes scenes from a Busby Berkeley clone, a Gene Kelly-inspired musical, a Cecil B. DeMille-influenced “Prestige” Bible Epic, and some hokey cowboy flicks. Although technically a comedy, the film doesn’t offer the same level of laughter provided by Raising Arizona, The Hudsucker Proxy, and The Big Lebowski. Instead, it’s content to gently poke fun at the recognizable and beloved output of an industry that was fighting off the allure of television. There are some good one-liners and offbeat moments (ever hear the one about the priest, the rabbi, the minister, and the movie exec…) but the goal is more to provoke chuckles than guffaws. The absence of a strong narrative is the film’s weakest aspect. The Coens are so absorbed by their mimicry that they don’t invest a lot of effort in the connective tissue. Hail, Caesar! works best when seen as a series of loosely related vignettes. It’s great fun to watch George Clooney do a semi-serious Charlton Heston impersonation or Channing Tatum step into Gene Kelly’s tap shoes. The production values are second-to-none and, when we’re watching these movies-within-a-movie, it’s almost like viewing clips from lost 1950s artifacts that someone found and restored. There’s pleasure in this experience although perhaps not for the average multiplex-goer who will expect a better “wraparound” story to tie everything together. Eddie Mannix (Josh Brolin) is the head of Capitol Pictures and Hail Caesar! chronicles a day in his life. The movie is bookended with trips to a confessional. This is apparently a regular routine; the beleaguered priest informs him that he comes a little too often. Eddie has a lot on his plate. One of his star actors, Baird Whitlock (George Clooney), has been abducted by “Communists” and they are demanding a $100,000 ransom. America’s Sweetheart DeeAnna Moran (Scarlett Johansson) has become pregnant out of wedlock so a cover story has to be devised to protect her reputation. Esteemed director Laurence Lorenz (Ralph Fiennes) is on the verge of a nervous breakdown after being required to cast cowboy matinee idol Hobie Doyle (Alden Ehrenreich) in his latest character-driven piece. Gossip columnist sisters Thora and Thessaly Thacker (Tilda Swinton) are badgering Eddie for exclusives while he’s weighing an offer to leave the “circus” and join Lockheed Martin. The Coens gain traction and mileage by not being overtly satirical with their ’50s pastiches. They avoid Mel Brooks territory and instead stay true to the tropes and approaches of the time. The tongue-in-cheek elements are limited; the comedy comes from recognizing that these fake films are representative of the real output of the era. As a result, Hail, Caesar! comes across not as a harsh, take-no-prisoners evisceration of Old Hollywood but a playful recreation. One doesn’t doubt that studio heads of the time faced many of the issues confronted by Eddie. The degree to which this is representative of how filmmaking actually worked is up for debate but, much like My Week with Marilyn, there appears to be verisimilitude in how it pulls back the curtain. As with Woody Allen, the Coens have reached a level of prestige where they can cherry pick A-listers to appear in relatively small roles. Hail, Caesar! is an ensemble production. Actors like Scarlett Johannson, Ralph Fiennes, Channing Tatum, and Jonah Hill have limited screen time. George Clooney has more of an opportunity to leave an impression but about half of his scenes are clips from the movie-within-a-movie. Only Josh Brolin, whose impressive versatility is often overlooked, is given the opportunity to develop a character. The Coens have never made movies with the primary goal of achieving huge box office numbers. Their films have often been described as “quirky” and have frustrated viewers expecting something more accessible. 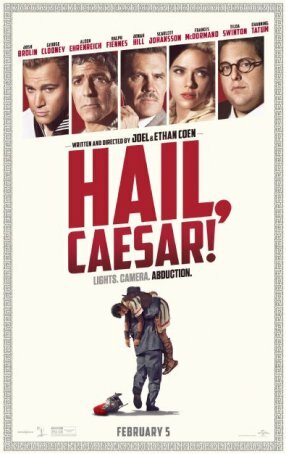 There’s nothing obscure about Hail, Caesar! but it is, like most Coen Brothers movies, made with a select audience in mind. The more 1950s movies a person has seen and the greater their love for Hollywood of 60+ years ago, the greater their appreciation will be of what Joel and Ethan have brought to the screen. Appropriately for the time of year, Hail, Caesar! is a Valentine - a love letter to a time when life was simpler and movies were bigger. Even if it accomplishes little else, this production captures that with good humor and a little madcap zaniness.